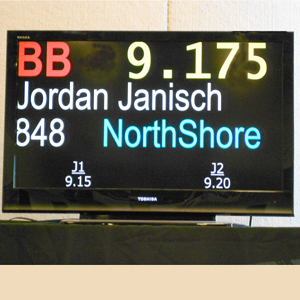 Let me Score Your Gymnastics Meet using *NSGEL's WiFi networked iPads, PC/Proscore software, and Flat Screen TVs. Let me make your meet a success with problem free scoring! Live scores streamed to this Website and MSO. Four iPads (Judge #1,#2,#3,#4) can be programmed for each event (VT,UB,BB,FX) using 16 iPads. I can do a custom configuration. Scores are displayed on Flat Screen TVs via HDMI. Custom graphics and reports can also be displayed. *NSGEL have four sets of scoring equipment that can be rented. Equipment will be delivered to your meet and set up. I will also be there to help and make sure everything works okay if you decide to use my services. See the equipment specs below. iKeypad (iPad - see pic below) are user friendly and require very little training. Multiple features ensure that results are entered correctly and displayed. 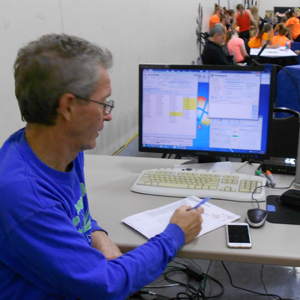 Reports are printed within minutes of the last score being entered and verified. New features include on-line streaming of results to this site and MSO. Link from your Web site so parents can view updated results every 60 seconds! 55" Flat screen TV display. Up to four TVs can be connected for multiple displays. Open Scoring: all judges scores displayed and then the average. Ideally the display must be located near 110volt AC outlet. Connected to Computer by HDMI cables. Optional WiFi connection to display and computer. 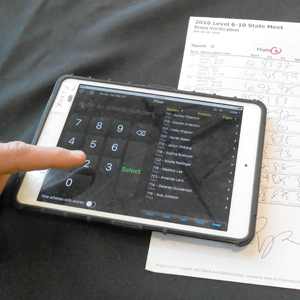 Scores are entered on an iPad (iKeypad). 2 iKeypads can be programmed for each event: Judge#1 Judge#2 (State Finals). Up to 4 iKeypads can be programmed for each event: Judge #1,#2.#3,#4 (Regional Finals). iPads are connected to the PC via WiFi router. B&W Laserjet printer supplied and paper. Laptop also supplied along with the WiFi router. Live streaming of scores to this site via facility WiFi access point if available. Also live streaming to MyMeetScores if requested.